An integral component of the “National Master Plan”, the Santo Domingo metro network was constructed to improve the transportation in Santo Domingo, the capital city of the Dominican Republic. It is a relatively young metro, that is yet to celebrate its ten year anniversary. However, it is still considered to be one of the largest metro’s in the area surrounding Dominican Republic. The network officially began operation for commercial use in the year 2009, after previously being functional for non-commercial uses for almost a year. It runs on 2 lines, serving 30 stations in total and covers a track length of 27.4 km. Despite its comparatively small size, its annual ridership still amounted to 61,270,054 in the year, 2014. Map of Santa Domingo Metro Line 1. On weekdays the trains operate between 08:00-17:00 and on Saturday they begin operations at 08:00 am and run till just 12:00 pm. The fare payment system for the Santo Domingo metro is made via a contactless card called the DOP card. The basic price for the card is DOP$60. Users of the metro system have a choice between three different types of tickets. A one ride ticket, a ten ride ticket and a twenty ride ticket. Each of these cost, DOP$20, DOP$185 and DOP$360. Children under the age of 4 need not make any payment for using the metro. There are many park and ride lots available at each station. There is a limit with regard to the baggage that is allowed on the metro. Also, seats are reserved for the pregnant women and the disabled people who use the metro. While travelling with children, keep a watch on them. Make sure that neither you nor your child cross the yellow caution line, for any reason that might come up. Animals are prohibited within the metro network. Similarly, smoking, drinking and firearms too, are prohibited within the network. A rather strange rule but one which is designed to address the safety issues is that children below the age of 10 aren’t allowed to travel the metro unattended. Currently Santo Domingo Metro System has 2 lines serving 30 stations. The second line was opened in 2013 and before the opening of second line almost 30,856,515 passengers rode the metro in 2012. Four more metro lines are under planning stage. 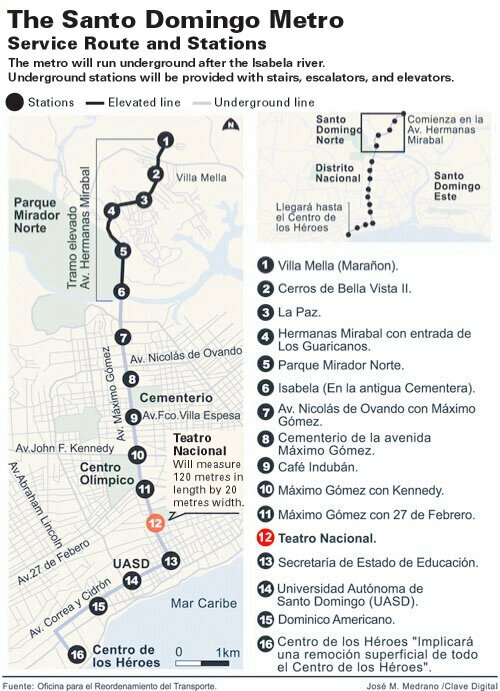 ● Line 1 – Line 1 is 14.5km long and the metro operates between Villa Mella and Centro de Los Heroes. It serves 16 stations and was the first subway system to be constructed in the Dominican Republic. Line 1 was opened to the public in 2009, with an estimated daily ridership of 2,00,000. ● Line 2 – Line 2 is 12.85km long and the metro operates between Ave Luperon and Puente de la 17 serving 14 stations along the way. It runs in an east-west direction and intersects with line 1 in the heart of the city. The construction of the line was started in 2009 and it was opened to the public in 2013. The line runs entirely underground. Does it have a station at the internattional airport? ?